I recently stumbled across a movie called Love, Simon. It’s a young adult romance about a kid who is learning to accept who he is and who he loves. The heart of the story is how one person is learning how to be gay. One person’s story is one person’s story. If you take a closer look, this story is about learning to embrace who you are as a person. It’s about finding the people who accept you for all that you are. That’s easier said than done, no matter your sexual orientation. Who wouldn’t enjoy a story like that? 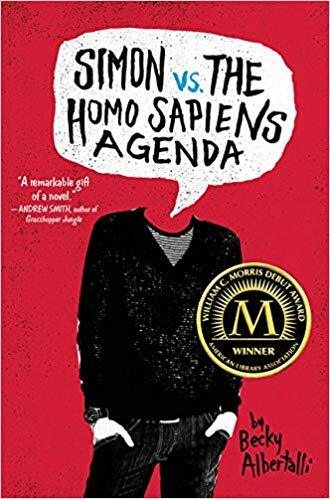 When I found out the movie was based on a book called Simon vs. the Homo Sapiens Agenda, I immediately went to the library. As is usually the case, I liked the book more than the movie. It went into more gritty detail and told me everything I wanted to know. Simon’s story is universally applicable in many ways. We’re all afraid to show people who we really are as people. Simon is learning through the safely of email correspondence. Then life is complicated by an email falling into the wrong hands followed by a bit of blackmail. I’m not going to tell you if Simon and his mystery email partner wind up together in the end. That’s not how life works. Life is about the journey. Read to find out how Simon finds his way in the world. Who knows, you might learn a few new things about yourself along the way. That’s the mark of a truly great book. But maybe that’s just me. Albertalli, Becky. Simon vs. the Homo Sapiens Agenda. New York: Balzer & Bray, 2015.